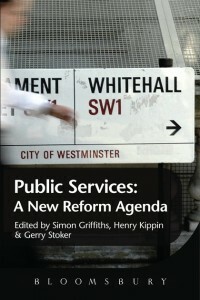 Public Services: A New Reform Agenda, a collection edited by Henry Kippin, Simon Griffiths and Gerry Stoker, brings together some of the UK’s leading public policy experts to explore the long-term challenges facing public services. Janet Newman welcomes the book’s focus on the need for a new public services settlement and detailed empirical evidence on the benefits of reform, but argues that a more rounded conception of the social than is offered by the authors must underpin the reform agenda. Public Services: A New Reform Agenda. Henry Kippin, Simon Griffiths and Gerry Stoker (eds.). Bloomsbury. July 2013. This is undoubtedly a crucial time to be thinking about the future of public services. The current regime of cuts, austerity and the political drive to downsize the state have challenged he most basic assumptions of what public services are for, as well as how they should be delivered. This volume offers a series of contributions on how the future might be envisaged. It originated in the Commission on 2020 Public Services and proposes a new social contract between state and citizen that might displace the Beveridge settlement and thus offer a sustainable future for public services. This is an ambitious project, and has contributions from many of the leading figures in the field. But the book has been long in the making (the Commission was held in 2009). It traces the contours of what has since become an accepted repertoire of behaviour change strategies, the shift of responsibility to citizens, and the move to a more plural marketplace for public service delivery. In some places the rather long genesis shows (some of the chapters do go over rather old ground). However both the editors’ introduction and the ‘afterword’ by Ben Lucas, Gerry Stoker and Matthew Taylor, together with some of the chapters (for example Christopher Hood on future finance options), firmly position the volume in the current era of austerity and the policies of the Coalition government. This means that while the book offers a welcome antidote to narratives of loss, failure and a politics of decline, it also makes for a rather chilling read in places. The volume is organised around three key themes. Part One focuses on establishing ‘A New Relationship Between State and Citizen’, and includes chapters by Gerry Stoker on the ‘microfoundations’ of citizen motivation and behaviour; Michael Kelly on a civic approach to public services; Polly Vizard on capability approaches; Peter Taylor-Gooby on public service reform and social inequality; and Annabelle Lever on democracy and deliberation. Together these offer a relational rather than institutional perspective, thus challenging the precepts of the New Public Management. Interestingly the chapters do not all take the same position. For example, Kelly’s analysis of the ‘moral pluralism’ that informs citizen views of public services implicitly challenges the behavioural economics discussed by Stoker, while Taylor-Gooby suggests how a focus on ‘empowering’ citizens through the new social contract can serve to exacerbate social inequality. Part Two, ‘A New Public Service Ecology’, addresses public service delivery. It includes chapters on fostering a diverse market (Paul Grout); on the role of the third sector (Pete Alcock); on targets and performance indicators as the basis of accountability (Deborah Wilson); on choice and competition in health care (Carol Propper); and on ‘joined up’ public services (Patrick Dunleavy). Most of Part Two now seems rather dated: the benefits of digital era governance, the limits of performance indicators and even the limits of ‘choice’ are well known, sometimes even by policy-makers. However the detailed empirical evidence offered adds value that those promulgating more polemical stances on choice, diversity and marketisation ignore to their peril. And again there are interesting tensions between chapters: the expanded role for the third sector envisaged by Grout is rather undercut by the cautionary comments of Pete Alcock. Part Three addresses the prospects for a ‘New Fiscal Relationship’. Here Howard Glennerster proposes a ‘new social partnership’ between states and citizens to tackle long-term pressures on welfare states. Many of his proposals are already in place: new forms of funding for higher education that shift the cost to students and families, the raising of the retirement age to reduce the pensions burden, while health reform and eldercare are already the focus of significant policy shifts. However the problems these shifts seek to tackle have not necessarily been resolved. Christopher Hood’s chapter on public service reform in a ‘cold fiscal climate’ is more forward-looking and challenges some basic assumptions, both about the continued viability of reform measures introduced in the ‘fat years’ and about the sustainability of some public services in the face of radical financial stringency (his unfortunately named ‘East of Suez’ option envisages sector or service abandonment by the state). In collected volumes such as this it is possible to quibble about what has been omitted: readers may note the absence of, for example, green agendas, and there is scant attention to the role of local government and community services. The ‘whole system’ approach promised by the use of the term ‘public service ecology’ is, then, not realised. But I want to step back and ask a rather more difficult question. Should those committed to public services accept the current consensus on public service reform? Or is it simply a question of how best it can be realised? Despite the welcome focus on the need for a new social settlement the book offers a rather thin conception of the social. It is one based on an individualised idea of the citizen; relationships between citizens, and how these might be fostered, are not part of the agenda. And the current political climate is accepted without question. There is, for example, no mention of taxation reforms as a partial response to public service financial difficulties. Finally, there are few ideas here that might contribute to the reinvigoration of the public culture from which public services derive their legitimacy, and to which they might contribute. This is, then, a very British conception of futures. The absence of international contributions matters here: the British way is perhaps not the only way. Janet Newman is Emeritus Professor in the Faculty of Social Science at the Open University and Visiting Professor of Social Policy at the University of Bath. She is the author of the 2012 book ‘Working the Space of Power: Activism, Neoliberalism and Gendered Labour’ (Bloomsbury Academic). Read reviews by Janet.